There’s been much discussion of late about the ‘changing face of the high street’. One noticeable change in York over recent decades is the shift towards pedestrianisation, keeping traffic from the city centre. Yet once upon a time, not that long ago, our towns were geared to the needs of the motorist. These photos of York from the second half of the 20th century (1960s, some perhaps from the early 70s) succinctly illustrate this recent and quite fundamental change. The motorist in need of petrol didn’t go out to Tesco on Clifton Moor, but could find it here, on Bootham, at the entrance to Bootham Row, right next to the Bootham Tavern. 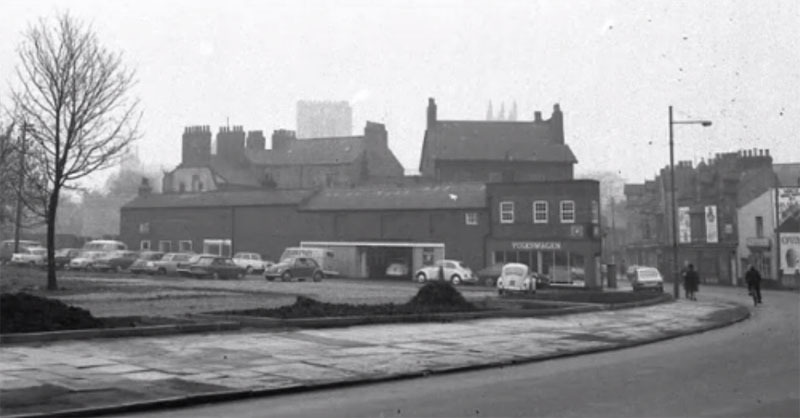 Now the site of a busy Sainsbury’s Local, with apartments above. Now the site of Whackers and the residential development alongside. 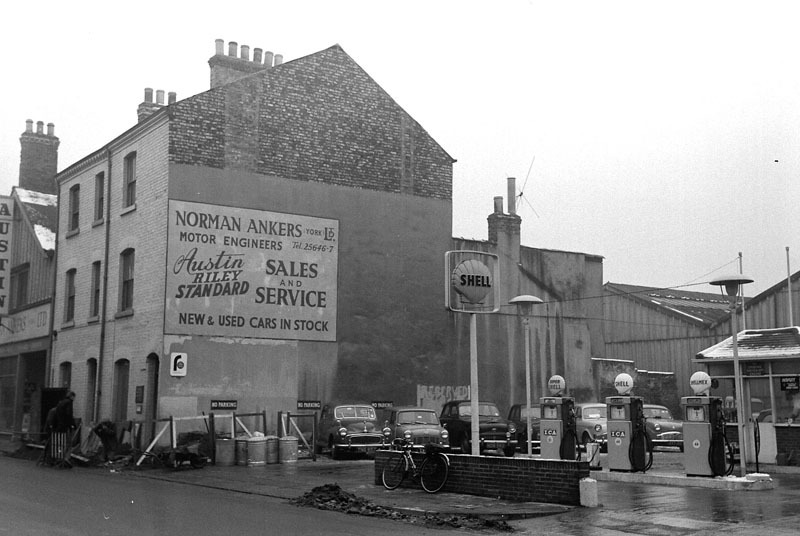 Further down the street, with a prominent ad for the other Ankers site, a car showroom for Ankers. The building is now occupied by the GMB union. 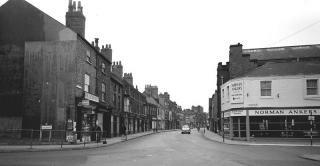 Moving along, but not far, just onto Clarence Street, looking back towards town, with the Minster visible on the horizon. VW cars for sale here. Where now is a massive modern building, the Fountains Learning Centre, part of St John’s. And at the other end of Clarence Street, at the edge of the Groves, by the Castle Howard Ox, more petrol. I vaguely remember this still selling petrol, but it doesn’t anymore. 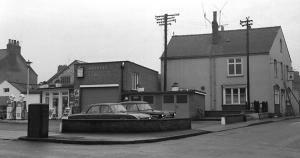 Its forecourt is now valuable parking space, and its buildings used by InCity Motorcycles and a tool hire business. What’s most obvious is that these places pictured, selling petrol, selling cars, are so close together, on a few streets just outside the city walls. 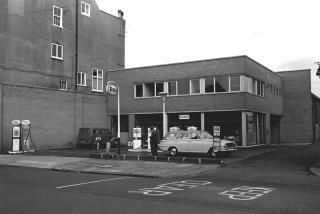 Now, the car showrooms and filling stations are out at Clifton Moor, a great long stretch of them lining that unmemorable road I can’t remember the name of, on the way to Tesco. I don’t drive, have never wanted to, but perhaps it would have been more appealing back then, with curvy cool cars for sale on Gillygate, and petrol for sale every few hundred yards. Excellent article. It was only the other we were talking about this, in particular, picadilly where the current Weatherspoons Postern Gate is and fulford road near the police station. Regarding the image of Walker’s Garage. I remember this well as I would walk past here as a child in the early sixties on the way to my Grandparents who lived in Stanley Street. At this time Walker’s also ran a wedding / funeral car hire service. These cars were garaged in the large workshop that is set back on the right of the image. I was fascinated with all things automotive, and clearly remember nearly all of these hire cars were large black Humber’s, Pullman’s, Imperial’s and Super Snipe’s.